If we can learn one thing from the Parapan Am athletes, it's that we can fulfill our dreams and find greatness in the most difficult and unconventional of circumstances. But we need to believe in ourselves, first and foremost. Then we need to follow through with hard work and grit. The Toronto Parapan Am Games will be the largest ever held, with more than 1600 athletes from 28 countries. Attend the Games to support the athletes but, more importantly, to be inspired and empowered by them. I recently came across the incredible story of Jen Bricker. Born with no legs, Bricker fulfilled her dream of becoming a professional acrobat despite her disability and all the odds that come with that. Today, she's training to become a dancer and tours the United States as a motivational speaker. By definition, self-confidence is the belief in your ability to accomplish the task at hand. In Bricker's case, that belief was never questioned or doubted but rather nurtured by the closest people to her, her family, hence her strong belief in herself. That belief enabled her not only to disregard her physical disability but also to compete against able-bodied people and win a state championship. That is taking self-confidence to the next level and following through on one's dreams against all odds. That is grit. Psychologist Angela Lee Duckworth defines grit as passion and perseverance for very long-term goals. "Grit is having stamina. Grit is sticking with your future, day in day out," she says in her popular TED talk. The 2015 Parapan Am Games, happening now in Toronto until August 15, are a great opportunity to celebrate and be empowered by the unwavering grit of para-athletes. Take Canadian wheelchair basketball player Abdi Dini, who is a Class 1, which in wheelchair basketball means the least mobility. Dini became paraplegic when he was injured at the age of 10 by a roadside bomb in Somalia. After moving to Canada with his family, he found his calling in wheelchair basketball and committed himself to the sport. He has since won multiple medals in his career, including gold at the 2012 London Paralympics. Another inspiring story is that of para-swimmer Aurelie Rivard, who used to have panic attacks before her swim meets. But she has overcome her anxiety and gone on to break Canadian records several times. 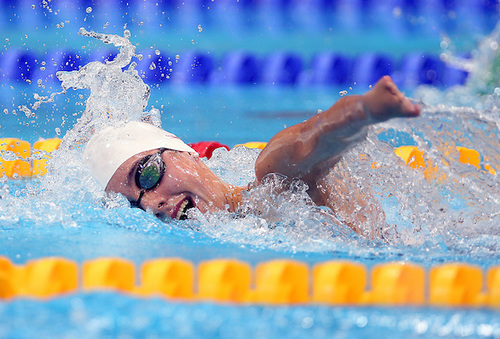 Today, Rivard is the "new face in Canadian para-swimming." If we can learn one thing from the Parapan Am athletes, it's that we can fulfill our dreams and find greatness in the most difficult and unconventional of circumstances. But we need to believe in ourselves, first and foremost. Then we need to follow through with hard work and grit. The Toronto Parapan Am Games will be the largest ever held, with more than 1600 athletes from 28 countries. Attend the Games to support the athletes but, more importantly, to be inspired and empowered by them. To see the full schedule and buy tickets, go to Toronto2015.org.